Being an Internet marketer, I keep on trying different tools and software which makes my work easy. For example for my day to day task tracking, I am using to do list app which helps me to organize and complete works on time without a miss. You can check my Mega List of Best Blogging Tools which will help you to do the things faster. If you are a marketer then you must have worked different Project Management Tools like Trello, Basecamp, AceProject etc. but sometimes we need more than just these tools. You will feel the need when you will have to deliver the project in limited time. That time you just need something which can make your work fast and easy. Today, I have come up with an amazing Add-ons for Asana, Basecamp, and Trello which will make your things damn faster. It will power up your data through its exclusive features. Let’s talk more about Bridge24 in this Bridge24 review. 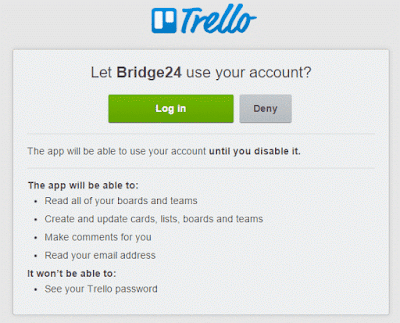 Bridge24 is an Add-on that extends the functionality of some popular tools like Trello, AceProject etc. to get you the missing and advanced features easily and within your reach. 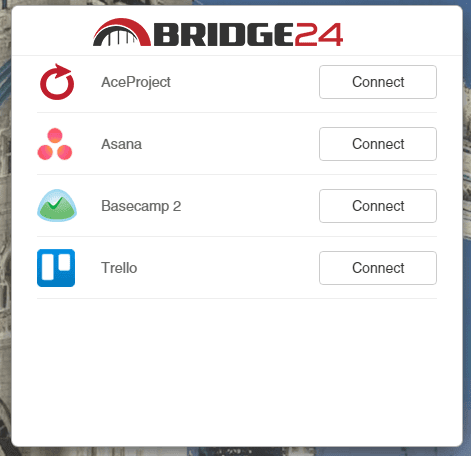 With Bridge24, now in just a single click you will get the data you want and wherever you want. It is a perfect tool to enhance your productivity by Bridge24 Inc.
Also, they keep on releasing the new and enhanced features which help the users the keep themselves more productive with the technology. Well, you may say that why Bridge24 when you have the software like Trello, Asana etc.? Ok…the answer is with you! We had mobile phones but we needed a smartphone...right? But why? Just to increase our productivity, to get multiple things done at a single platform and much more. The same applies here as well. We had a base platform with the different project management software but we needed to something so we can get the things done faster, more precisely and effectively and so Bridge24 came in existence. 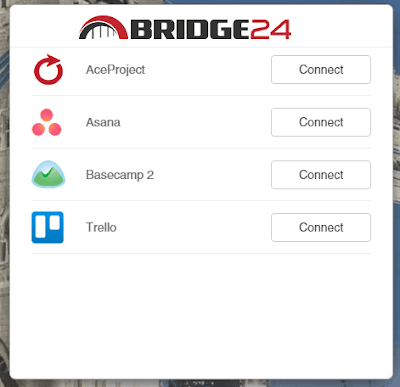 Currently, Bridge24 supports following 4 project management tools and all you have to do is just connect your tool to Bridge24. Now as I am using Trello for my normal use and so I clicked on Trello to connect and it has redirected to a page where I have to provide my Trello credential. Once done, you can start using Bridge24. Currently, this tool is free to use and you don’t have to pay any kind of charges for the use. It also supports multi-languages and is currently available in English, French, and Spanish. Apart from the fact that it is a free tool, there are several other features those Bridge24 provides which makes it a must have tool for all the marketers and business owners. It helps the user to connect to their existing online productivity tools and see the data just in seconds with a click. The dynamic connectivity of the Add-on allows the user to view and interact the data in their existing project management tool through Bridge24 dashboard. You would be able to view the recent data, charts etc. and if you will make any changes to the data or app from Bridge24 interface, those will get updated in your parent app as well. With a recent update to the tool, now it is easy for users to look out all the necessary files or documents. View, edit or manage all kind of records, images or PDFs with just one click. You can also check these in bulk. Many other features have been included like the flexible view, you can preview the docs while editing and much more. Filters and grouping are easy to manage and can also be saved. 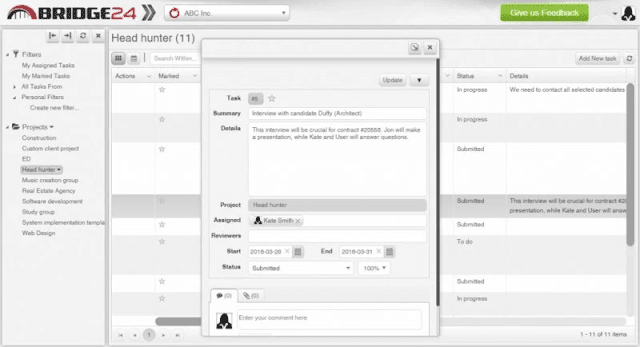 Users can add single or multiple tasks. A new Feedback form allows users to share thoughts, comments and suggestions to developers quickly, and a redesigned Avatar window now provides more links and access to the latest blog and social media information. You would be able to access all your products and data from the Bridge24 platform of your parent project management tool. You can also do most of the operations and can track all the charts, projects etc. From being on the same platform. With a recent update, users of Asana, and Basecamp can now view their tasks and To-dos is a Kanban board style layout, and easily change the order and flow of their work. This feature will soon roll out for the other tools. They keep on rolling the updates to make this tool as handier and easily accessible as they can. It has an improved user experience with its intuitive UI coupled with pop-ups, windows, and a minimal dashboard that gives an eagle eye for all the ongoing processes. Editing now can be smoother and you can do these operations in bulk as well. What others say about Bridge24? This was all about the Bridge24 review. This is really a must have tool for all the marketers or all those who uses a project management software for their works. It is easy to use and the UI is more interactive and so anyone can easily operate it. Moreover, it’s free and so you can try it without any hassle. Do share your experience with me after trying Bridge24!